Celebrate New Years Eve at the Beach! Start a new tradition this year – ring in 2017 at the beach! 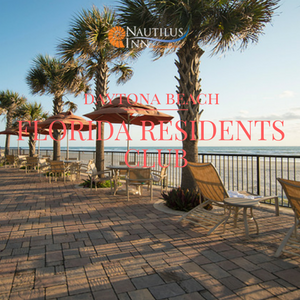 With exciting New Year’s Eve celebrations happening at Nautilus Inn and throughout the Daytona Beach area – book your vacation today! Celebrate Christmas ... at the Beach! The Nautilus Inn today announced that it has received a TripAdvisor® Certificate of Excellence. Now in its sixth year, the achievement celebrates hospitality businesses that have earned great traveler reviews on TripAdvisor over the past year. Daytona Beach Fall Festival Season is Here! Daytona Beach has a flair for festivals and fall is a great time to visit! Daytona Beach takes claim to the title of Festival Capital of Florida for good reason with festivals and events taking place here year round. Empty Nester Travel Season is Underway! Now that the kids have moved out of the house, it's time to do something that is just for the two of you with a getaway to Daytona Beach, Florida! Each year, nearly 125,000 motorcyclists roll into the Daytona Beach area for a multi-day, annual event called Biketoberfest. October 7th through 9th marks the annual Daytona Blues Festival which has rapidly grown into a family-friendly musical tradition throughout Central Florida. The festival features dozens of up-and-coming artists as well as some of the biggest names in blues music. Daytona's Fall Adventure Experiences - Naturally! Make Your Plans Now To Join In A Fall Festival! Daytona Beach has changed a lot over the past few years. Long gone are the ideas of beach fare ... fried, fried and more fired! Now Daytoan Beach culinary offerings range from traditional ethnic eateries to the vibrant social atmosphere of microbreweries and wine bars. Celebrate Independence Day Weekend on the Original American Beach! Whether you're looking forward to traveling with family or friends, Daytona Beach is a great choice for your upcoming Independence Day celebrations! Daytona Beach's endless coastline awaits for a magical summer escape, from a romantic boardwalk stroll under a firework-filled sky to an invigorating day of riding the waves. As the Original American Beach, we celebrate the tradition of summer vacation with a water, sun and, of course, fun! Just in time for the Summer season, the Nautilus Inn completed the final touches of a mult-year room refurbishment program. Ray DeNure and staff, worked with a team of talented designers to complete a head-to-toe refurbishment of the guest rooms of his family property. Celebrate a break from school and work with these top Daytona Beach family-friendly activities! Whether you prefer to lounge by our pool, bike along the beach or go on an exciting paddleboard adventure, Daytona Beach offers a variety of recreational activities for all! 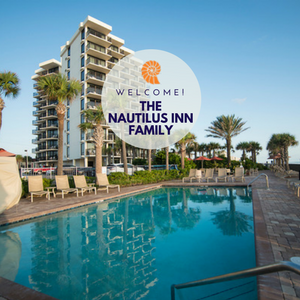 Offering one of the best values on Daytona Beach, we invite you to book your next getaway at Nautilus Inn and experience our newly decorated oceanfront and ocean view rooms! With Valentine’s Day falling on a Sunday and Presidents’ Day the next day, many people will try to carve out a long-weekend getaway. Some, families whose kids get Presidents’ Week off from school will try to carve out the whole week for a beach getaway. Daytona Spring Break 2016 Is Coming Soon! Ready to fast forward to spring break? Treat yourself this spring to the beach vacation you crave in Daytona Beach, Florida! And there's a lot to announce for the upcoming Spring Break season!